Joel Embiid’s second defensive play in the NBA ended with him wrestling Steven Adams to the floor. Adams is a burly fucker with a nasty attitude, but the rookie went straight at him the first chance he got. On his first offensive possession, he immediately pulled up from three. He missed, just as he picked up a foul tussling with Adams, but he came into the game swinging, and didn’t really slow down. The Sixers won’t be good this year, but they lost a very entertaining 103-97 game against the Thunder, and Embiid was right at the center of it all. His first bucket came after he hit a dream shake at the free throw line then smoothly pulled up. He followed that up immediately by swatting the life out of this Russell Westbrook layup. Embiid was out there at the end of the game, when the Thunder finally separated and locked down the win, still cranking shots and driving straight into defenders. He’s rough around the edges, but he’s unbelievably smooth in the post, and he appears to have some decent range. 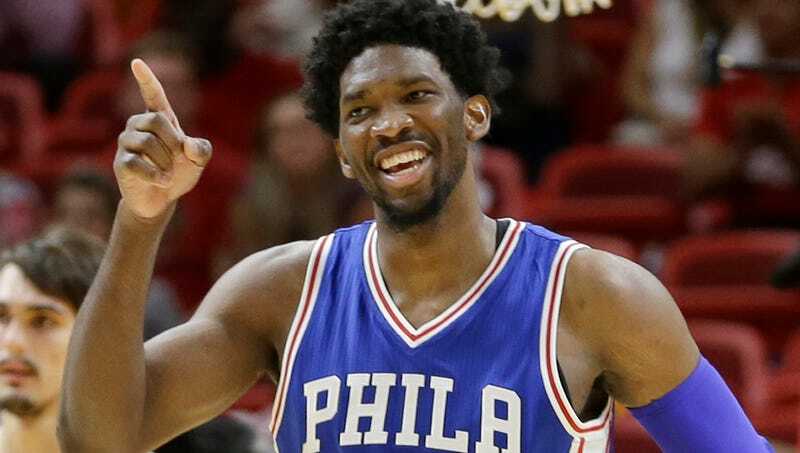 Embiid picked up 20 points, seven rebounds, and a pair of blocks, along with four fouls and four turnovers in 22 minutes of work. He also clowned on Westbrook after shutting him down, earned “MVP” chants, and yelled “HE CAN’T GUARD ME!” at Adams like a cocky eighth grader scoring in their first high school game. Nobody has ever been as confident as this man in their debut. I hope his legs don’t turn into a pile of dust.